Kim Kardashian was just returning from a business trip. 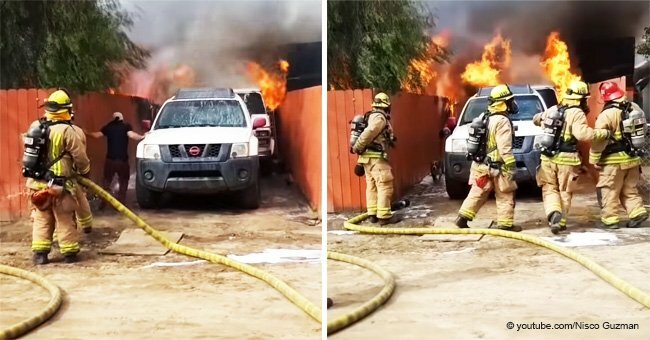 When she landed she found out she only had one hour to evacuate her California home. The reality tv star took aerial shots of Calabasas and shared it to her Instagram story as she fled her property. She implored her fans to pray while she herself prayed everyone was safe. According to the Daily Mail, wildfires had begun to plague the neighboring city of Chatsworth on Thursday afternoon. Flames of the Woosley fire encapsulated several houses. It expanded to cover 4,000 acres and has affected surrounding neighborhoods including Hidden Hills were Kim lives. A mandatory evacuation was issued. The 38-year-old took a private plane to travel to her sister Kendall Jenner's house in Beverly Hills. 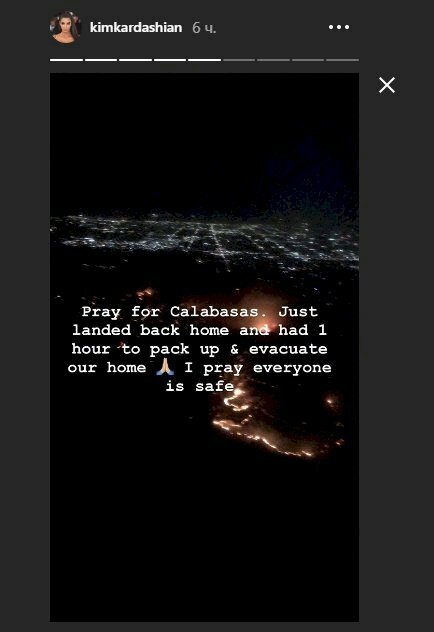 "Pray for Calabasas. Just landed back home and had 1 hour to pack up & evacuate our home. I pray everyone is safe." Kim was returning home from the San Quentin jail. She is working towards getting a death row inmate released. 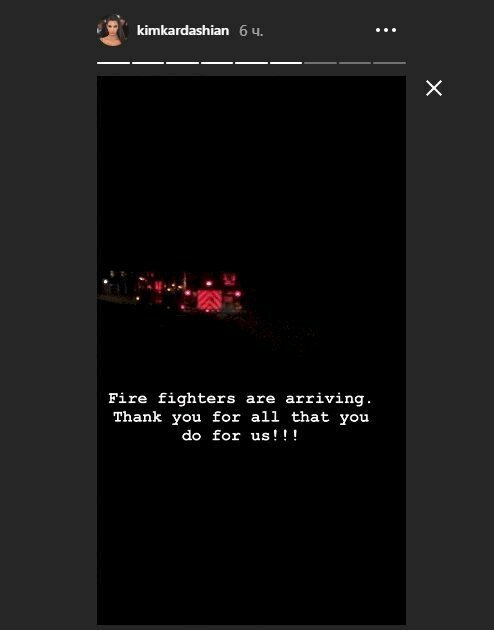 "Fire fighters are arriving. Thank you for all that you do for us!!!" She also joked about raiding her sister's pantry for food when she arrived. The 15,000 square foot home is shared with Kim's husband, rapper Kanye West. It is estimated to have a value of $20 million. Kim's sister Kourtney also leaves in a Calabasas, along with their brother Rob and mother Kris Jenner. Kris was in New York supporting daughter Kendall at the time of the mandatory evacuation. Rob, who was not given evacuation noticed, was accompanied by sister Khloe and her daughter True as the fire went on. "I am with Rob, Dream and True and I am up keeping watch! Saying prayers and thanking all of the brave firefighters who risk their lives for us." About 75,000 homes bordering the Ventura and Los Angeles countries were given evacuation orders. Another fire is raging east of Camarillo within the Santa Rosa Valley, and west of Simi Valley close to Newbury Park and Thousand Oaks. Thousand Oaks, the sight of the most recent mass shooting which left 12 people killed, was also given orders. It has been dubbed the "Hill Fire" since it broke out on the southern Hill Canyon. This morning, the Ventura County Fire Department said the blaze grew to between 8,000 and 10,000 acres. 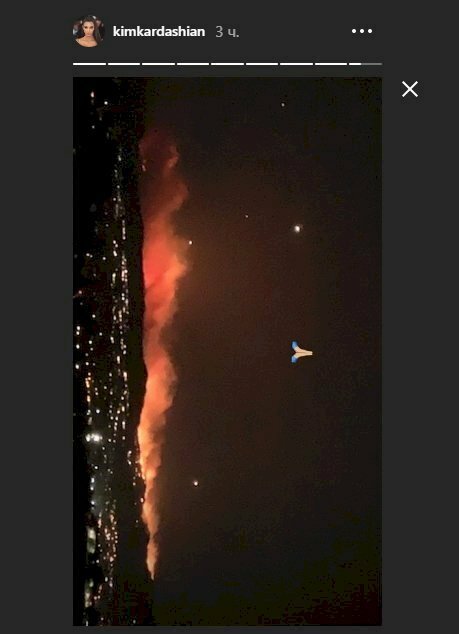 Rainn Wilson, an actor and producer, tweeted to fans about his neighborhood's evacuation. "My House has been evacuated due to nearby fires in Thousand Oaks. 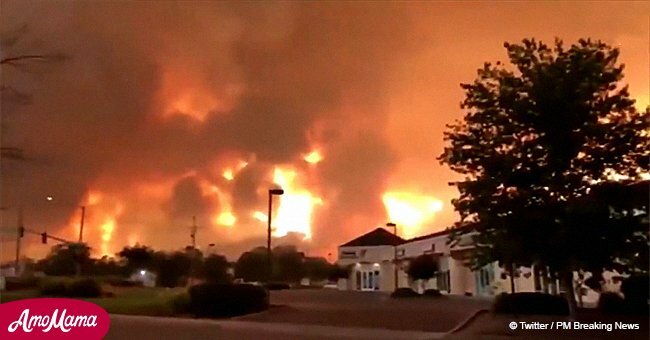 (The pigs & dogs are fine, thank you)"
The third fire, called the Camp Fire, is threatening homes in Northern California. The blaze is burning near Pugla and has already led to a number of mandatory evacuations. Several houses have already been burned amid the 20,000 acres the fire has covered. Cal Fire officials say up to 15,000 other structures are in danger. Fortunately, they have 2,289 fire personnel working to end the blaze. 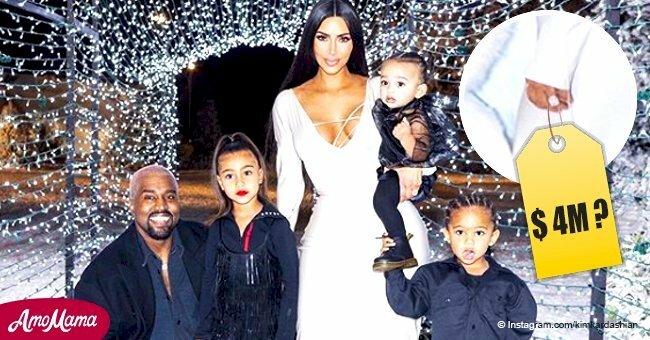 For Kim Kardashian, another threat is so great to her that she won't have any more kids because of it. 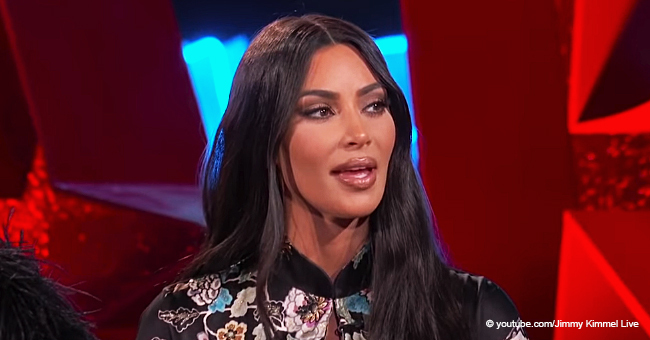 Last month in an episode of "Keeping Up with the Kardashians," the mother of three revealed that gun violence is at the forefront of her brain. "The world is just so different now than when I grew up, so I've been kind of hesitant about having more kids," Kim said. "Lately there have been so many devastating school shootings. As a parent, the thought of bringing your kid to school and having them not come home because of a senseless shooting is something that definitely consumes me," she continued." 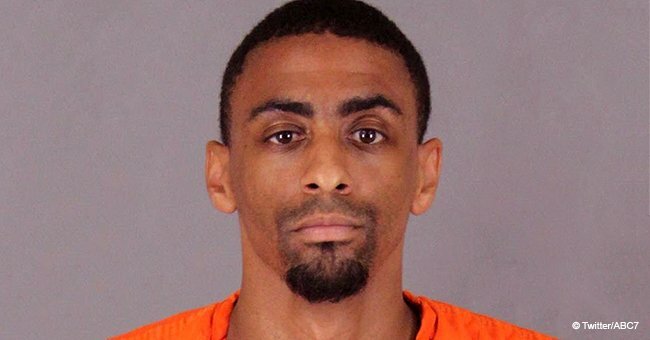 With the most recent shooting, the star is perhaps even more hesitant now to have another child.